What an inspiring and amazing experience it was to attend the SCBWI NY 2013 conference! I got to meet all the other members of my writing group, the MiG writers, who are just as wonderful in person as they are online. They are (from left to right): Kate Fall, Debbie Ridpath Ohi, Carmella Van Vleet, Christina Farley, and me. Susan Laidlaw wasn't in this picture, but she was at the conference too, taking time out from her world-wide adventures to hang out with us. Aside from the socializing, I also enjoyed all the content! One of the common themes I noticed was how many of the speakers mentioned books from their childhood and the important place these books have in their lives. Books are a safe haven (Emma Walton Hamilton and Julie Andrews), with “characters that felt like friends or the friends I wish I had” (Margaret Peterson Haddix). It reminded me of my own reasons and passion for writing children’s books – to provide that experience of immersion in another world, to create that all important book friend for someone else. Mo Willems: “Your job is to be some child’s best friend”. Another important takeaway for me reinforced something I already strongly believe in: the importance of ordinary, everyday experiences. Jennifer Besser (Publisher at G.P. Putnam and Sons) talked about how using your power of observation allows you include small details that keep your work “fresh”. Artist Shaun Tan was all about looking at things you see every day “in a new way”. 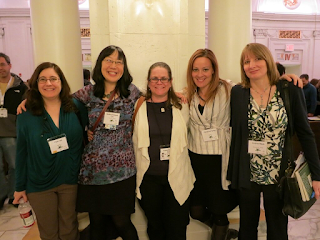 For more on the SCBWI conference and a fun video of the MiG Writers, check out Christina Farley's SCBWI NY Conference Recap. There are so many more bits of advice I collected, I know I’ll be feeling inspired for months to come. The best thing was coming away from the conference fired up and ready to write! I even started a new picture book manuscript in the airport on the way home. Sounds like an awesome trip. That's great you went with friends. The thought of those big conferences sound overwhelming. Can you do me a favor? My Trip to China post will not come up on my blogroll. I've tried posting it as a new post 3 times. Can you shout out about it? Thanks. I'm sorry I missed the conference. My kids love Mo, and I had a bunch of books for him to sign for my daughter. What a great experience. I loved attending SCBWI conferences. The best part is to meeting up with writer friends (and you've got some great ones). Sounds like you got inspired. Good luck on your new PB. I'm inspired just by reading your notes about it. Thanks so much. I wish I could've been there with you. Love that Mo Williams quote.